I think we've been pretty successful so far at throwing entertaining birthday parties with fun themes. 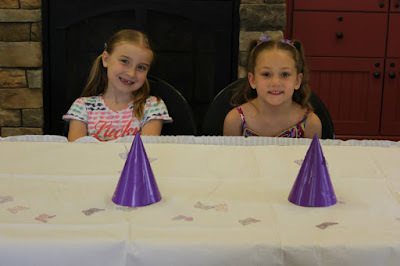 We go with the theme when picking out the invitations, & we've let you & your little friends dress-up in the themes for most of your birthday parties. That's kind of as far as we've taken your birthday party themes up until this year. I typically get a little lost in the details. We went to one absolutely stunning birthday party. EVERYTHING went along with the theme, down to the smallest detail. I was absolutely stunned & inspired about how much everything seemed to fit together so beautifully & brilliantly. This year I wanted to focus a little more on the details. I created a Butterfly Birthday Party Pinterest Board. It included DIY pins that looked like they wouldn't drive me crazy with complexity while also being cute. That's why I decided this year I would make your party hats. I found these on Pinterest. 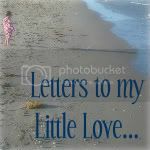 They were adorable, & I knew I could easily create something fun & similar. 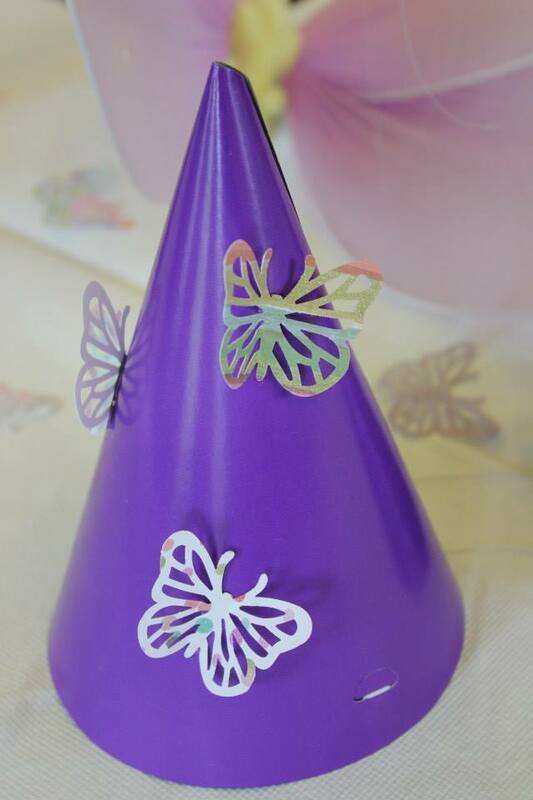 Rather than cutting out a ton of butterflies, I bought a butterfly punch from the craft store. While watching TV, I punched out beautiful, little butterflies out of scrap-booking paper. I was so excited that this DIY was really going to be as easy as it looked. 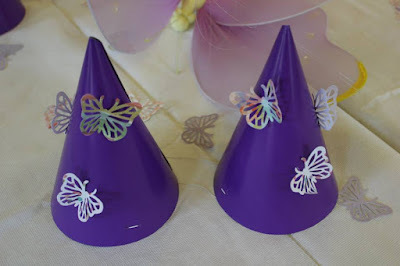 A few days before your party, with six other DIY activities to focus on, Nonnie casually mentioned that it might be easier to purchase purple & green party hats rather than trying to construct them ourselves. 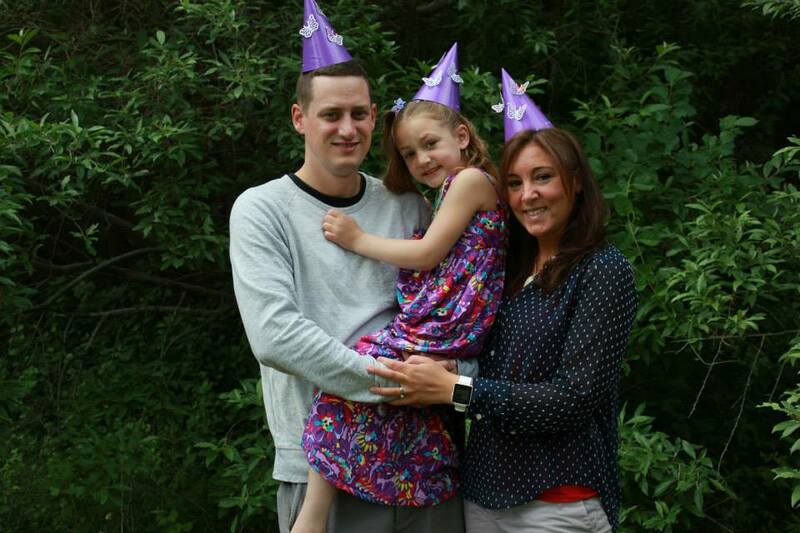 She was right, but purchasing party hats wasn't as easy as I thought it would be. It was then that I learned how hard it is to find/buy party hats in one color. I can't even tell you how many stores I scoured, searching for purple & green party hats. Every store had multicolored hats with patterns or hats in rainbow colors. Augh! I turned to the Internet. With only a couple days before the party, I grabbed the only purple hats I could find that had free 2 day shipping. Green wasn't even an option. Sorry to all the kids who don't like purple. 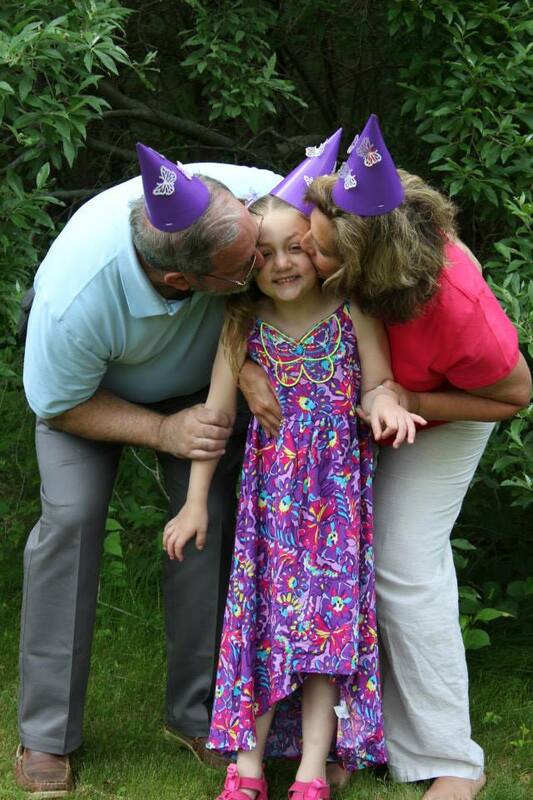 When the hats came in, Nonnie took this DIY project right out of my hands & made them look beautiful. She used a glue gun to fasten my butterfly cutouts to each of the hats. They looked perfect. 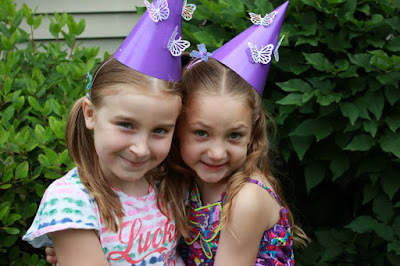 In the end, the hats weren't the complete DIY project I planned, but you loved the butterfly birthday hats...& I think everyone else did too. Oh, & by "DIY," I mean the only thing I did myself was punch out the butterflies. Ha! Thanks, Nonnie!